The FRESH 2017 CATALOG illustrates the exhibiting photographers selected for the Klompching Gallery annual Summer exhibition. Co-curated by Darren Ching and W.M. Hunt, the exhibition features the photographic artworks of FRESH 2017 exhibiting artists Giles Clarke, Nicolo Sertorio, Jamey Stillings, Krista Svalbonas and Gesche Würfel. Juror statement by W.M. Hunt, as well as an introduction from the Klompching Gallery. The catalog also features the ten FRESH 2017 finalists: Michael Borek, Victoria J. Dean, Andy Mattern, Ben Marcin, J. Fredric May, Rebecca Moseman, Lydia Panas, Jon Spencer, Stephanie Taiber and Aaron Wax. 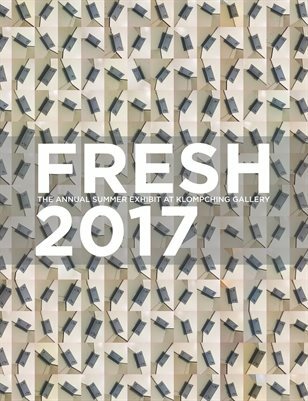 FRESH 2017 exhibited at at Klompching Gallery in New York, July 13–August 5, 2017.